I’m having a beer and a burger at a bar and grill in Easton, Pennsylvania, and checking tomorrow’s weather forecast on my cell phone again. The chance of rain keeps increasing; it could rain most of the day. Not good, but at least the forecast improves in the following days. My cycling friend Bob from Michigan will arrive soon. 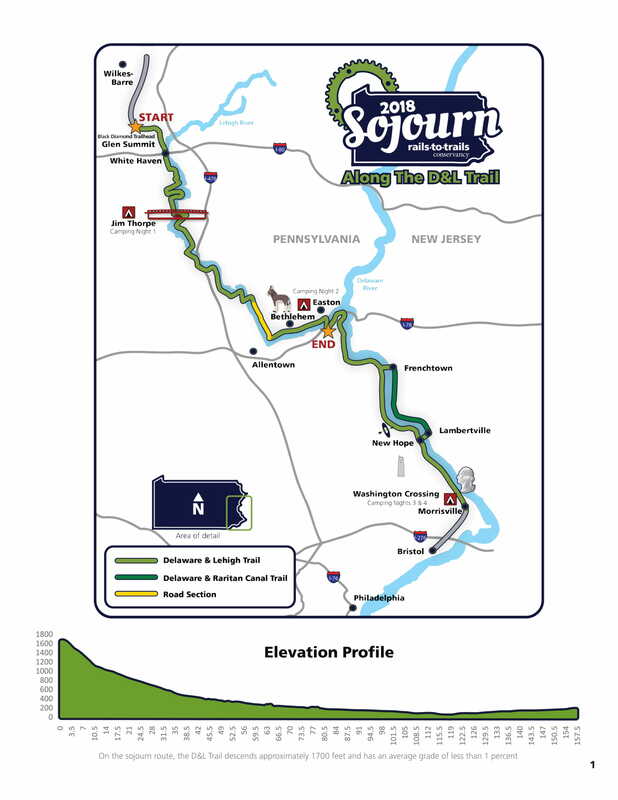 Tomorrow morning we will drive from our motel to nearby Hugh Moore Park to join the Pennsylvania Sojourn, a five-day bicycle tour organized by the Rails to Trails Conservancy, a nonprofit organization dedicated to creating a nationwide network of trails from former rail lines. We will travel on the Delaware and Lehigh Trail on rail trails and canal towpaths through the Lehigh Gorge and to the towns of Jim Thorpe, Easton, and New Hope. Our route will follow a system of railroads and canals developed in the 1800s to transport vital anthracite coal from the mines near Wilkes-Barre to Philadelphia. 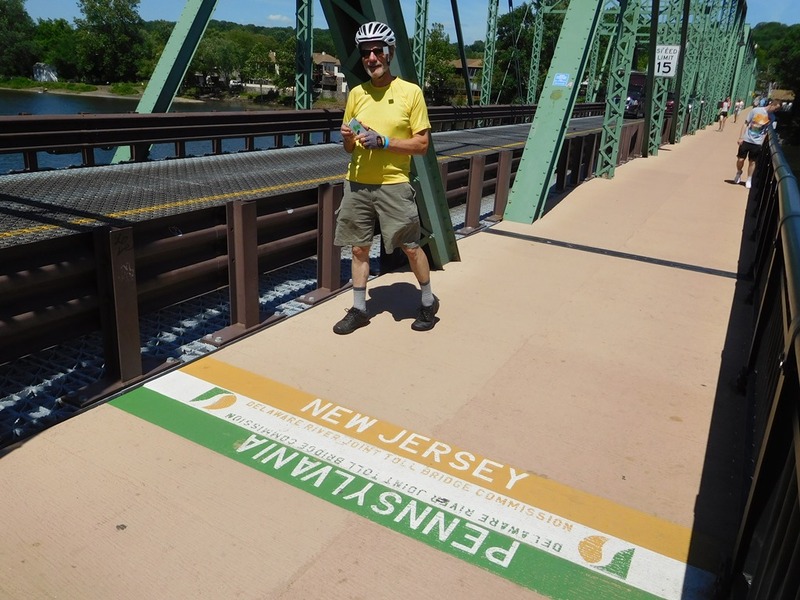 We will also cross the Delaware River and ride along New Jersey’s Delaware and Raritan Canal, part of a similar system built to transport freight between Philadelphia and New York City. Rails to Trails has been running Sojourns since 2002, mostly in the Northeast and Mid-Atlantic. Meant to celebrate existing rail trails and draw attention to gaps in trail systems, the multiday rides have been very popular. This year’s Sojourn has drawn some 300 cyclists from 30 states. This is my first Sojourn, and Bob’s too. It will also be our last. Rails to Trails just announced that, despite the popularity of the tours, the organization is shifting its priorities and will no longer run Sojourns. I am bummed to hear this. We arrive at Hugh Moore Park on Sunday morning before 7:00 a.m., park our cars, unload our bikes, and register for the event. We load our luggage onto one truck and our bikes onto another. We load ourselves into one of the waiting school buses, which transports us an hour and a half north to the starting point of the ride in Lehigh Gorge State Park, somewhere in the remote hills of northeastern Pennsylvania. It is raining lightly but steadily when we arrive at Black Diamond Trailhead and retrieve our bikes. It feels chilly for mid-June, and we are eager to start pedaling to warm up. We head off down the trail through the rain toward Jim Thorpe. Today’s ride is only 35 miles, all gently downhill or flat. It should be easy, but the trail is saturated and messy. It varies from a single track to a double-track path, and the surface ranges from packed dirt to fine loose gravel. We veer from one side of the trail to the other, trying to find the best way through the puddles and muck. We stop for a welcome lunch break in White Haven, 10 miles down the trail. Lots of wet, grimy, and cold cyclists pile into Antonio’s Pizza, where we order slices and sandwiches. I warm up with coffee and a hot slice of pepperoni pizza. Before Bob and I head out into the rain again, I add a long-sleeved shirt beneath my rain jacket, which has already soaked through. The trail widens a bit, and the rain eases for a while. By now I’ve gotten used to being wet and dirty, but our bikes are taking a beating. Bob and I stop twice to squirt water from our bottles onto our derailleurs and chains to wash off the accumulating gunk. Our bikes make an awful grinding sound when we brake. My chain skips now and then, but otherwise my Trek 520 touring bike, which I’ve ridden some 30,000 miles over 15 years, is doing okay. It has weathered drenching rain and mucky paths before. But about 10 miles from Jim Thorpe, my rear wheel suddenly locks up and I skid to a stop. I get off the bike to see if maybe the chain has fallen off. Instead I find that the lower part of the derailleur has somehow pulled sideways and jammed into the spokes. I have no idea how this could even happen. I tug and pull and finally wrench the derailleur free. I discover that the lower of its two rotating cogs is completely locked up with grit. I squirt the rest of my water onto the cog and manage to wash off enough grit to get it rotating again. I’m finally able to continue pedaling. But when I shift gears a while later, the derailleur slides sideways and jams into the spokes again. This time it’s even harder to extricate. I pedal on again, but now I avoid shifting at all. I count down the miles to Jim Thorpe. Farther down the trail, I and some other riders stop to try to help a woman who is also having bike problems. The bearings in the bottom bracket—the “axle” that the pedal arms attach to—have ground to a halt. She can no longer pedal. We can’t fix her bike, so she calls the tour’s rider support number to summon one of the roving mechanics riding somewhere along the trail. As we head off, she begins to walk her bike toward town. We finally straggle into Jim Thorpe, with Bob’s disc brakes grinding badly and my 27-speed bike reduced to a single speed. We join the crowd of fellow cyclists milling around in front of Pocono Biking, which is providing mechanical support for the tour. Many have lined up to hose off their bikes and themselves, creating a beach of gray grit on the sidewalk. The shop’s mechanics are performing triage on dozens of crippled bicycles. As we wait for them to assess ours, I start shivering again. Our campground is a half-mile walk from here up a steep hill. Dinner is not provided on the tour tonight, so after setting up our tents in the soggy campground we are supposed to head down the hill into town to find a restaurant, and then trek back up the hill again. As we mull over that thought, the mechanics’ verdicts come in: both our bikes are unrepairable with the parts and tools at hand. Bob’s brake pads have been ground away, and my derailleur mishap has bent part of my bike frame. We overhear another cyclist asking about nearby hotels. One is right behind the bike shop, just steps away. Cold, wet, and demoralized, Bob and I agree we should look into it—and quickly, before the place fills up. As he waits to hose off, I dash around the corner. Tiny Hotel Switzerland has just a few rooms left. I reserve our best option: a room with a queen bed and private bath. It will beat setting up camp in the rain at the top of that hill. Lots other cyclists who had planned to camp opt for hotel rooms too. We will be the most comfortable campers on the trip that night. Bob and I lock up our bikes and arrange for a tour staff member with a minivan to shuttle us up to the campsite, where our luggage awaits, and back. We lug our duffle bags upstairs to our tiny hotel room—just large enough to walk around the bed, but with a roomy, private bathroom. Bob offers to sleep on the floor. We shower and change into dry, clean clothes; hang our dirty, soppy ones wherever we can; and go to the restaurant downstairs to eat dinner and consider our options. By now I am in full emotional response mode. I’m ready to quit the tour. I want to find a way to get me and my damaged bike back to Easton, load up the car, and go home. But the weather forecast for the next couple of days is good, and Bob, in a more calm and rational mode, wants to try to find a way to continue the trip. After dinner we drop by Pocono Biking and ask about rentals. We also arrange to have our own bikes transported with our luggage back to Easton, tomorrow’s campsite and where our cars are parked. With the logistics figured out, I calm down. We decide to continue the tour, at least for now. The next two days are everything the first day wasn’t: sunny, warm, and dry. The riding is mostly carefree and easy. The rental bikes are adequate. 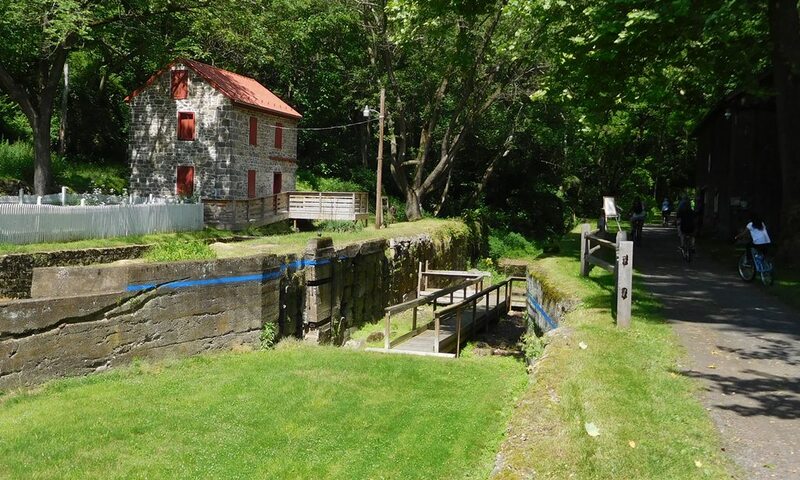 I enjoy examining the canal structures we pass, visiting the National Canal Museum in Easton, and comparing these canals to those I’m more familiar with, the Chesapeake & Ohio Canal and the Erie Canal. At our second night’s campsite in Hugh Moore Park, I retrieve my bike and lock it onto the rack on my car. Bob calls around and finds the brake pads he needs at a bike shop in Easton. The mechanics in camp are able to get his bike repaired, and he turns in his rental bike to them. One of the two remaining lock houses on the Lehigh Canal. 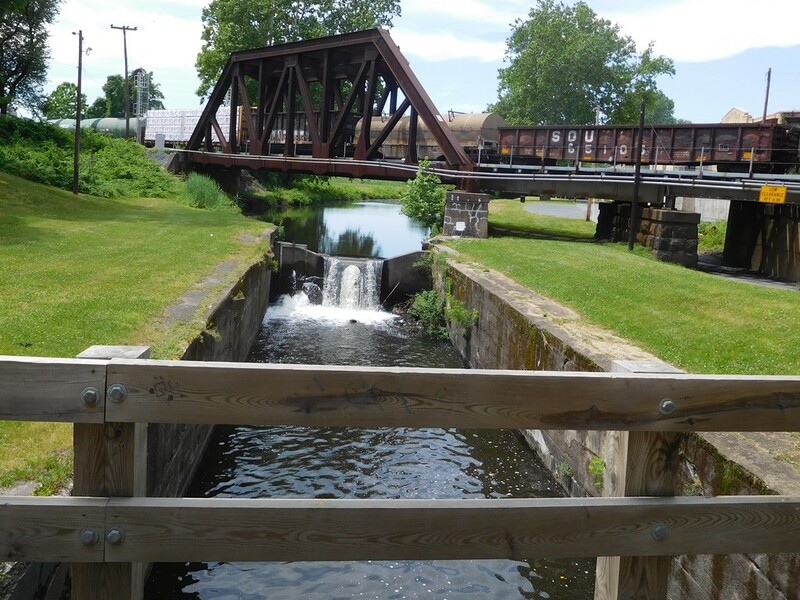 A lock on the Lehigh Canal. 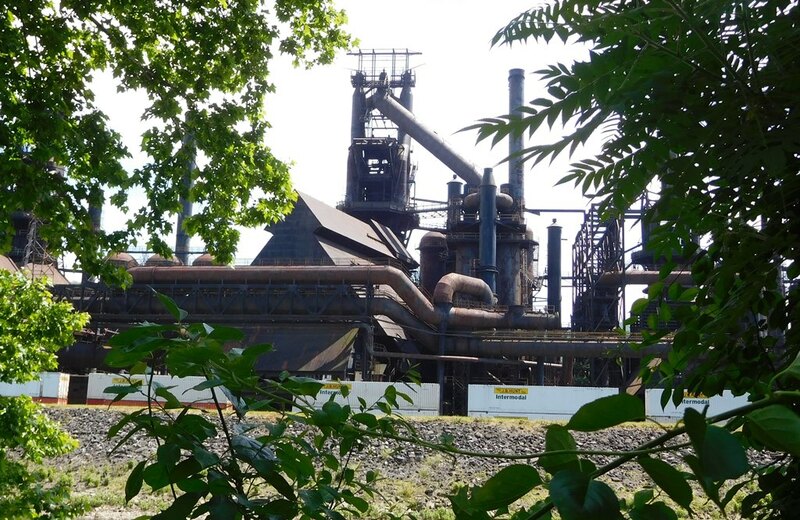 Industrial ghosts: blast furnaces at the remains of the Bethlehem Steel Plant. A canal boat ride at the National Canal Museum in Easton. The campground for the next two nights is at the upper unit of Washington Crossing State Park, a couple of miles beyond New Hope. I am not happy to discover that our camping area is rife with poison ivy, to which I am extremely sensitive. I step carefully and manage to avoid contact. Day four will be a layover day. Some riders had preregistered for a kayaking trip or a tour of the state park, which preserves the area where General George Washington and his troops crossed the Delaware River on Christmas night in 1776 to surprise and defeat the Hessian forces at Trenton. I plan to explore the park and New Hope on my own. But once again, weather comes into play. Rain is forecast for later today, the last thing we want to deal with again. And neither of us is looking forward to largely retracing our route back to Easton tomorrow. Now it is Bob who favors cutting the tour short. He has made up his mind; he’s ready to leave. I am conflicted. But I’m also looking forward to driving up to Albany, New York, to visit friends after the tour. I call and they tell me I’m welcome to show up a day early. I make up my mind. With the sky overcast but the rain holding off for now, we pack up our tents and gear. We learn from some tech-savvier campmates how to use Uber, our best option for getting ourselves back to Easton. I turn in my rental bike to the mechanics. After some difficulty due to our remote location, we finally book an Uber to Easton. We load up and depart. Bob heads back to Michigan. I head for New York State. Our Pennsylvania Sojourn is over. A few days after I returned home, I took my bike to REI for service and repair. Its mechanics managed to straighten the bent and twisted derailleur hanger on the frame. The frame could have broken during that process; if it had, the bike would have been a total loss. They will replace the derailleur, cassette, chain, crankset, and possibly the bottom bracket, which was full of grit when they took it apart—basically the entire drive train. It will be expensive, but I’ll have my bike back soon, ready to roll again with brand new components. I’m not inclined to provide a detailed critique of a tour that won’t happen again, especially one so different in nature from others I’ve taken. Touring on trails and towpaths presents unique challenges, including lack of access to roving sag vehicles for aiding riders who need assistance. And anyone who has gone on enough bicycle tours knows that stuff happens. You get caught in the rain. It gets colder than you expected. The shower truck breaks down. There are not enough sinks and restrooms. The caterer runs late or runs out of coffee or food. Information is inadequate, inaccurate, untimely, or poorly relayed. Every tour has its snafus. Some are unavoidable; others reflect shortcomings in planning or preparation. This tour, in my opinion, had more than its share of these issues. But I also have to say that much went very well, that all the Rails to Trails staff and volunteers I dealt with were unfailingly genial and tried to be helpful, and that the Pocono Biking staff did a commendable job dealing with the effects of that disastrous first day. Even so, I am no longer so disappointed about the decision by Rails to Trails to end the Sojourn series. Many participants will likely disagree, but my sense is that bicycle tours are not the organization’s forte. I’m glad they offered these unique tours, and I’m glad I got to experience one. And I wish them well as they redirect their efforts and continue their noble mission of creating and promoting the use of trails across the nation. This entry was posted in Bicycling, New Jersey, Pennsylvania and tagged Bicycle Tours, Rail Trails. Bookmark the permalink.